This week it's going to be about books because, well, I'm just....a book blogger, that's all! This week has been a fantastic week for reading around these parts and I have totally enjoyed being surrounded by children who love books. "Oh, it's delightful to have ambitions. I'm so glad I have such a lot. And there never seems to be any end to them -- that's the best of it. Just as soon as you attain to one ambition you see another glittering higher up still. It does make life interesting." 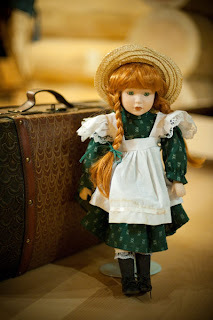 - Anne, Anne of Green Gables. And so it does! I could not possibly agree more if I tried. 3. (I know this is a repeat for some of you, but bear with me for a single second.) I've been having fun looking up Anne things! I really get a kick out of enjoying books. Did you ever think of Cherry Ames as being part of the mystery genre? Well, she was! (Esp. some of the later titles.) 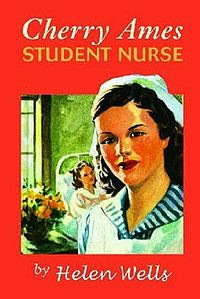 I read these books when I was a teen and was pleased to discover that they have been republished! I owned 5 or 6 from when I was younger (and they are old and falling apart). I didn't have the first book though so I bought a copy and am diving in and having fun with that. More on Cherry in the very near future! 5. I just LOVE to read. (No, no really!) I am truly enjoying what I'm reading these days. I don't feel bogged down with review copies I don't feel like reading anymore (now that they are finally here) and I'm able to take the time to BE with the books I am choosing to read. I'm giving myself time to think through what I've read and it just feels nice. Books are so much a part of who I am, that I'm glad to finding the reading experience blissful instead of feeling pressured to just crank stuff out. I hope that whether you are participating in challenges or not, you are finding the time to read and that you are enjoying the books you pick up! Love the visual I have of you and your son at Goodwill sorting through the books! I agree with Ellen. A blogger Anne-lover trip to PEI would be wonderful! I'm loving revisiting with Anne. too. 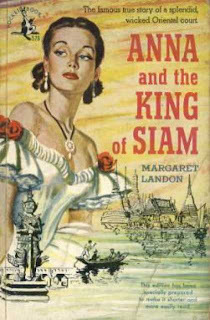 Anna and the King of Siam -- very good book (more brutal than the theatrical or movie productions). I loved Cherry Ames! How fun to find them again. I also loved Nancy Drew. Like you, I had some of the much older versions when I was a kid -- I remember spending my allowance on them at our church's rummage sale. I also remember being very creeped out by them. I haven't been doing much reading lately, and you've made me miss it! The used-book shopping trip sounds like so much fun! This is good, Carrie. I love "hearing" from people who obviously LOVE reading as you do. I love pulling out the old favorites. You can always tell if I've had a bad week by how many Nancy Drews are piled next to my bed. (Did you ever read the Dana girls? Heart!) Sounds like a very successful trip! How wonderful! I wish my lifestyle nowadays would allow me to be in the middle of books. Well, I'm in the middle of them actually but they're soooo not Anne of Green Gable-ish. I went crazy over Nancy Drew when I was in 7th grade, but weren't we all? :) Anna and the King of Siam is banned in Thailand, both book and movie. Maybe I'll get to read and watch it when I'm out of here. What a great mother you are to enjoy shopping with your son. That sounds like a fun outing to me, too. Oh, my...I've found a bibliophile after my own heart! I am SO glad I found your blog!! I was a Cherry Ames and Nancy Drew fan growing up, and seeing the book covers took me back. I have two stacks of books waiting by my bed. And I love the story of book shopping with your boy. Some of our best days are spent in a bookstore! Oh I am with you on #5! I've just plain been enjoying some books with no pressure and it's been great. I have never read a Cherry Ames book and I don't recall ever hearing of them either. I was a Trixie Beldon fan myself when a young teen. My daughter loves the Nancy Drew games. I read Anna and the King of Siam somewhere in my highschool years and really enjoyed it. I may be time for a re-read. I know you said you wanted to feature some ND games at 5M4B. We could squeeze it into "Books on Screen" (the computer screen!!). I just got Kyle a Whale book at the library yesterday (and picked up Anne of Avonlea for Amanda, because I have a copy on my Kindle. yay so glad to hear you got your prize, hope you enjoy it! I loved Cherry Ames as a girl. Totally wish I could get my hands on one! What fun!